Russia is planning to give China some stiff competition on the rare earth metals (REMs) market. The government is currently preparing a development program for Russia, which should be ready by February of 2013. Experts say that Russia will not be able to proceed along the road to innovation and protect its national interests without it. Russia has set out to consolidate its hold on the rare earth metals (REMs) market, which is now entirely dominated by China. By February 1, 2013, the government should have developed and approved a production program for rare earth metals in Russia, Interfax reported recently, citing a department in the financial-economic sector as its source. REMs comprise a group of 17 elements, including lanthanum, scandium, yttrium and lanthanide. These are ten times more abundant than metals such as molybdenum and tungsten. However, their extraction is a fairly expensive proposition: some $40,000 per ton, according to Roskill Information Services. REMs are used in a variety of different industries, including chemicals, glass, radio electronics, atomic technology and machine manufacturing. Rare earth metals are also used in miniature microphones, mobile telephones and batteries for gadgets. As well, they have found an application in hybrid automobiles (for example, Prius models made by Toyota) and music players (for example, the iPod from Apple). Moreover, these metals are used in the defense sector. Take, for instance, the samarium necessary for the magnets used in high-precision weapons. Without samarium, the United States could not produce its Abrams tanks or its Tomahawk missiles, its smart bombs or its Aegis Spy radars. Russian military production, as well, cannot do without rare earth metals. The global REMs market is valued at $15 billion annually. Today, China is the largest producer and exporter of REMs, supplying some 95 percent of world demand. However, China owns only a third of the world’s REMs reserves. In Russia, the situation is just the opposite: Russia’s share of the world’s REMs reserves is 20 percent, but it extracts only 2 percent of the world’s REMs; its production of goods containing REMs is less than 1 percent. “In Russia, the actual metal, the final production, is virtually not produced. We extract the raw materials, which are then processed abroad — in Estonia, Kazakhstan and Kirghizia. 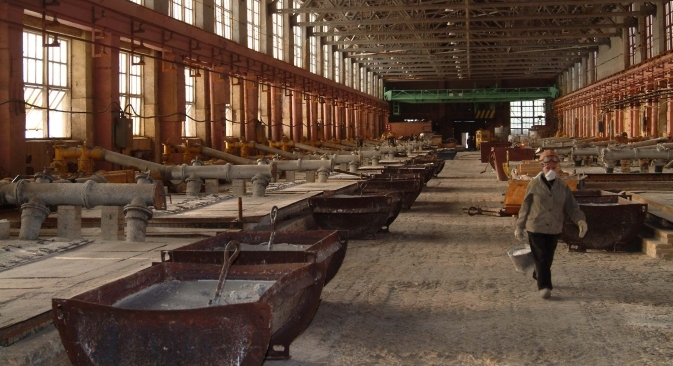 These are the costs of a system built in Soviet times: the factories that are able to process the rare earth metals mined in Russia are now, after the collapse of the Soviet Union, outside of the country,” said Dinnur Galikhanov, a senior analyst at Aton. At the same time, a number of companies in Russia that have access to these metals are not doing anything with them. “For example, the company Apatit owns a large number of deposits in the Murmansk region that are rich in rare earth metals. But Apatit produces fertilizers, so the precious metals remain in their pits, untapped and unused. Akron, another company that produces fertilizers, also owns deposits with large reserves of these metals. But it’s still not clear what Akron plans to do with them,” said a specialist in the field. Meanwhile, REMs are indispensable to Russia’s innovative development, since they are used in high-technology sectors. “If Russia actively wants to pursue the path of innovation – the path that Prime Minister Dmitry Medvedev is fighting for – then, without access to metals of this sort, achieving success in this will be very difficult and expensive. Russia will have to buy these metals on the world market at high prices,” said Galikhanov. Since 2003, China has been gradually lowering its volumes of REMs exports, to the dissatisfaction of the whole world. After a 30 percent reduction of exports in 2010, prices for REMs shot up by 20-30 percent. China based its reduction of these exports on the fact that, at the current rates of production, these metals would last only another 15-20 years. The United States and the European Union accused China of violating World Trade Organization norms, but got nowhere. “Russia also needs to produce its own rare earth metals to safeguard its military and nuclear industries. The current volumes of extracted metals are insufficient. Russia has to import rare earth metals for its needs,” said analysts at Aton. Information about the movement of REMs on the market is classified. According to Dmitry Baranov, a top expert at Finam Management, Russia most likely covers its needs for these metals with imports, which is a threat to its security. “In order to preserve our national sovereignty, Russia must produce more rare earth metals inside the country and not import them. The government is ready to invest resources in the solving of this problem and the support of private business in this industry,” said Baranov, who considers this a timely decision. Moreover, production of REMs has enormous export potential. “Even if Russia, America, Europe and Africa all get involved in this in the near future, they still won’t be able to satisfy the overall demand. What’s more, demand for rare earth metals will only grow, because the world is becoming more and more high-tech. Prices, too, will remain high. If one approaches this question in an intelligent way, then one can build a highly profitable business,” Galikhanov said. According to the analytical group Core Consultants, by 2015, the world shortage of critical REMs – including neodymium, europium, terbium, dysprosium and yttrium – could total 20,000 tons if China continues to reduce its exports. Consumption of these metals in 2012 was an estimated 140,000 tons, which should increase to 200,000 tons by the year 2015.